A TV personality and talented in so many ways, businesswoman Martha Stewart has a credible and lovely personality, making her a perfect spokesperson. She is professional, driven and ready to share her opinion and advise others. Below is an interview she recorded with BBC Kent about the idea of balancing a working life, a career and a family. If you're interested in a businesswoman for any radio or TV interviews please get in contact with us. Martha Helen Stewart (born August 3, 1941) is an American businesswoman, writer, and television personality. 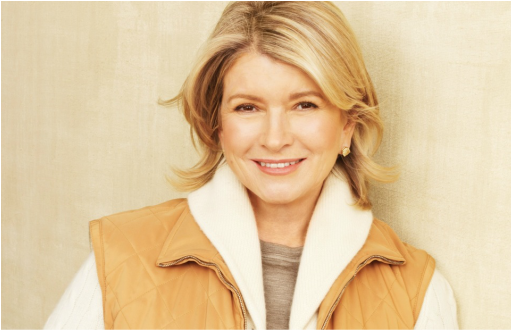 As founder of Martha Stewart Living Omnimedia, she has gained success through a variety of business ventures, encompassing publishing, broadcasting, merchandising, and electronic commerce. She has written numerous best-selling books, is the publisher of the Martha Stewart Living magazine, and hosted two long-running syndicated television shows, Martha, which ran from 2005 to 2012, and Martha Stewart Living, which ran from 1993 to 2005. In 2004, Stewart was convicted of charges related to the 'ImClone' insider trading affair and sentenced to prison. There was speculation that the incident would effectively end her media empire, although Stewart began a comeback campaign in 2005 and her company returned to profitability in 2006. Stewart rejoined the board of directors of Martha Stewart Living Omnimedia in 2011 and became chairman of her namesake company again in 2012. Andrew and Martha Stewart moved to Westport, Connecticut, where they purchased and restored the 1805 farmhouse on Turkey Hill Road that would later become the model for the TV studio of Martha Stewart Living. During the project, Stewart's panache for restoring and decorating became apparent. In 1976, Stewart started a catering business in her basement with a friend from her modelling days, Norma Collier. The venture quickly became successful, but soured when Collier alleged that Stewart was difficult to work with, and was also taking catering jobs on the side. Stewart soon bought her portion of the business. Stewart was also hired as the manager of a gourmet food store, the Market Basket, but after a disagreement with the owners at the mini-mall she was forced out and opened her own store. ​Andrew had become the president of prominent New York City publisher, Harry N. Abrams, Inc. In 1977, he was responsible for releasing the English-language edition of The Secret Book of Gnomes series, by Dutch authors Wil Huygen and Rien Poortvliet, which quickly became a blockbuster success and was on The New York Times Best Seller list. He contracted Stewart's company to cater the book release party, where Stewart was introduced to Alan Mirken, head of Crown Publishing Group. Mirken was impressed by Stewart's talent as a chef and hostess and later contacted her to develop a cookbook, featuring recipes and photos from the parties that Stewart hosted. The result was her first book, Entertaining (December 13, 1982), ghostwritten by Elizabeth Hawes. Following Entertaining's success, Stewart released many more books under the Clarkson Potter publishing imprint, including Martha Stewart's Quick Cook (1983), Martha Stewart's Hors D'oeuvres (1984), Martha Stewart's Pies & Tarts (1985),Weddings (1987), The Wedding Planner (1988), Martha Stewart's Quick Cook Menus (1988), and Martha Stewart's Christmas (1989), among others.